Sometimes the media come out with some fairly obscure records and odd statistics, but rarely when Arsenal was involved. So it was no surprise to find that the record that fell on 9 March 2015 was ignored by all the media, as was the fact that a Arsenal held on to a second record. By winning the FA Cup sixth round match against Manchester United on that date Arsenal secured their 28th FA Cup semi-final in a record dating back to the days of Woolwich Arsenal who reached the semis in 1906 and 1907. 28th is the highest number of semis any club has achieved. But more, the win also secured a place in history for Arsene Wenger. He had already had more semi-finals to his name than any other manager (10) and with this win took his number to 11. His nearest rivals Sir Alex Ferguson only achieved nine, and of course is no longer managing. What is interesting is how closely Manchester United and Arsenal have fought with each other over these numbers – while undoubtedly a lot of the time not being aware of the stats. Before the match on 9 March 2015 both clubs had 27 semi-finals each – it was the defeat of Manchester Utd at Old Trafford that took us ahead and into the lead. A similar proximity arises when one looks at actual appearances in the final: Before that game both clubs had won 18 and lost 9 of their semi-finals. Of the finals competed Arsenal had won 11 and lost 7 – exactly the same as Manchester Utd. Here’s a list of Arsenal’s semi-finals. 1980: Arsenal 1 Liverpool 0, after three draws – 0-0, 1-1, 1-1. 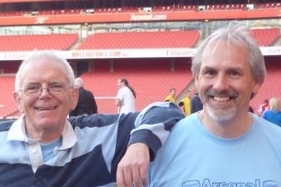 First to record my love of Arsenal, Arsene, and your website :-)! Anyway, just to let you know before it pops up some other way (as in we get hit over the head for ‘stretching’)! Sorry if I’ve potentially soured a worthwhile action on your part, – I do really appreciate what you do!!! Teams shown with an asterisk beside their name are no longer in existence. This table is updated as per the first Semi-final of the 2013–14 FA Cup.